khushi was staring at the computer in front of her wondering how to tell her boss, that sweet and kind akash ji, that she had no idea how to use these machines. haan, give her a kadai and a ladle and some oil and a bit of sugar, flour, besan, yogurt and she could create magic. but this funny thing with a screen… and if there has to be a screen it ought to show you screen things, right? like salman ji?!! khushi smiled at the thought of her favourite hero, how handsome he was, how wonderfully upright and honest; no goonda, nahiiin no rakshas, could come anywhere near if he were around. from the smile her expression changed to a grimace of severe distaste as she thought of the rakshas. but salman ji would never let that awful man who had dared to actually carry her… hawww. her mouth opened and the “hawww” came out loud and clear at the thought of arnav singh raizada picking her up and holding her in his arms. “staring as usual, miss gupta? and talking to yourself too?! interesting! i wonder how we could put these talents to use around here…” his voice was curt, with a funny sting in it, she looked around wildly to see where it could be coming from. think of the devil… did the rakshas have hidden cameras and microphones in all the rooms of his office! then she saw him standing at the door to her right, the one that was shut and she’d wondered about. now it was held ajar by him as he stood there looking at her, one eyebrow raised and a nasty lopsided smile on his handsome face. did she just describe his face as handsome in her mind?! khushi, tu paagal hai kya? “look miss gupta, for the kind of money i am paying you i do hope you can do a bit more than make faces looking into space and say incoherent things… akash will be here soon, please make sure work is done properly, and on time,” the words came quick and clipped and before she could respond, the door had closed, the man was gone. khushi stamped her foot indignantly and walked out of her room. she must find out something about the business of this shop and show this man what she was capable of. she was shashi gupta’s daughter, she’d helped him run gupta sweets ever since she was 12. straight after school she’d go to the shop and work till late evening, doing her homework at her little green wooden desk behind the counter. she knew a thing or two about running a business. otherwise would that irritating uncle come back every day for their mithais? who did this rude man think he was, crashing into her out of nowhere, jumping out from behind doors, and… and… carrying her?!!! “laad governor aaye hain bade,” she muttered as she went down the curved staircase toward the offices on the lower floor. he turned away from the door and went briskly to the work table where jean-pierre sat sketching. he could feel something flowing in him, opening up, he wanted to get down to the concepts right now. the tide coming in… ideas, he must catch it now, the best ones got lost otherwise. in a half meditative state almost, he reached for his laptop and placed it on the table among the sheets of paper covered with sketches and details and intricate doodles. frangipani. that’s what he’d called the project till now. 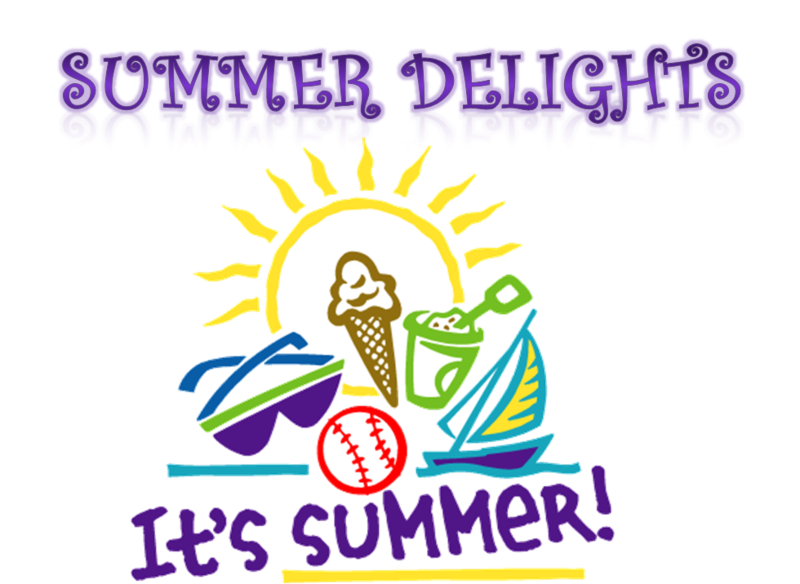 he frowned wondering if it was good or perhaps just plain… predictable. “frangipani!” he whispered under his breath, trying the name. “ahhnav, what did you say?” jean pierre lifted his head. “no nothing, just wondering about the name…” asr sat down at a high stool by the table and started working on his laptop. he wondered why when he said the word, he saw her turn her head slowly and reveal a bunch of creamy white frangipani yellow toward the centre, lying seductively at the nape of her neck tucked into the hand knot she’d tied with her hair. he could almost smell the heady evening scent of the flowers. frangipani… evening… scent… something was beginning to come together in his mind. khushi stood in the centre of the open plan office, at least 20 pairs of eyes fixed on her. all looked a bit startled, agog really, and there was an uncomfortable curiosity in some. she was coming down the stairs when payal had called to tell her bua ji and she had arrived. they were already at lakshmi nagar, the water problem had been fixed, all was well. khushi walked to a corner of the open plan office and stood there speaking to her jiji in hushed tones. “oh jiji, that’s good, and pata hai, i have been really missing you… haan haan, only one day, phir bhi,” she was toying with her parandi as she spoke, something in her feeling like a complete alien in this gleaming air conditioned office with its very non lucknowi air. “nahin jiji, i’ll come in the evening, after work,” khushi replied when payal told her to come over to lakshmi nagar. “work? kya kah rahi ho, khushi? what work?” payal asked. “executive assistant to akash singh raizada at ar industries, jiji,” khushi couldn’t keep the excitement from her voice. “what? pagal ho gayi ho kya? tum naukri kar rahi ho? what are you saying? oh no, khushi, now what crazy thing have you done!” payal was quite agitated by now, knowing khushi anything was possible and one look at new delhi station and its jostling crowds had told payal one had to be careful in this city. khushi felt a little sorry for keeping everyone in the dark, even jiji. there was a pause again as payal spoke at the other end. “i said, during take off arnav singh raizada HELD MY HAND! !” khushi said it all loud and clear. it was only when she heard the last few words herself, practically booming, that she shut up abruptly. with a hurried, and now again sotto voce, “jiji, hum rakhte hain abhi,” she quickly disconnected. she could feel the eyes on her even before she’d turned around. and the uncanny silence. the entire floor had heard her “HELD MY HAND” obviously and when combined with arnav singh raizada it created a volatile compound obviously, there was a sense of explosion all around. she looked on with panic in her eyes. what now! surely rakshas will throw her out of her job and that would be the end of her dream of making enough money for jiji’s dowry, she thought. then she saw a lovely young woman in the smallest dress she’d ever seen, with long never ending legs on even longer (or so it seemed) high heels in red, walk up to her swiftly. “what… did… you.. say!! ” the woman said furiously, though she kept her voice low. her face however was thrust aggressively at khushi. “huh!! n..nothing, was just talking to my jiji…” khsuhi mumbled, taken aback by that anger out of nowhere. “oh really, and whoever you are…” began her opponent. “chamkili, more like…” laughed the woman cruelly, “whatever. just don’t go dreaming dreams about asr, understand?” now her air was quite proprietorial. chamkili, shiny… not in the nicest way, more like wrapping paper or something, unpolished, a little gauche, overdressed, definitely downmarket. khushi giggled. if not being downmarket meant one had to dress in clothes that looked like you couldn’t afford more material, she’d rather not be upmarket, presuming that was the opposite of downmarket. “who dreams of a rakshas, sapne aayenge bhi toh bure sapne honge” she said under her breath. “what!! !” an expletive from the high heel lady. “lavanya!” akash’s soft and easy tone interrupted them. eyes till now fixed on the two girls turned toward akash who’d just strolled into the office, a palpable calm began to filter in. lavanya smiled at that and began to get distracted from her ire. akash had walked in a while back actually and heard the spat, everyone was too busy gawking to notice him. he wondered what lavanya would say if she heard bhai had in fact walked into their home holding this young lady in his arms. lavanya had long cherished dreams of being important to arnav singh raizada… really really important. not just a casual date once in a way. akash felt for lavanya, la to all of them. despite her haughty and at times pretty shallow ways, akash sensed a nice woman in her, a girl who could be kind and generous, and certainly la was sharp and great at her work, otherwise bhai would hardly promote her to marketing chief. “your e.a., akash? what about pam then?” la was most fond of pam, who never missed an opportunity to make la feel great about herself, indulging flagrantly in what khushi would have called “maska marna”, buttering. and la was highly susceptible to abject sycophancy, of course. 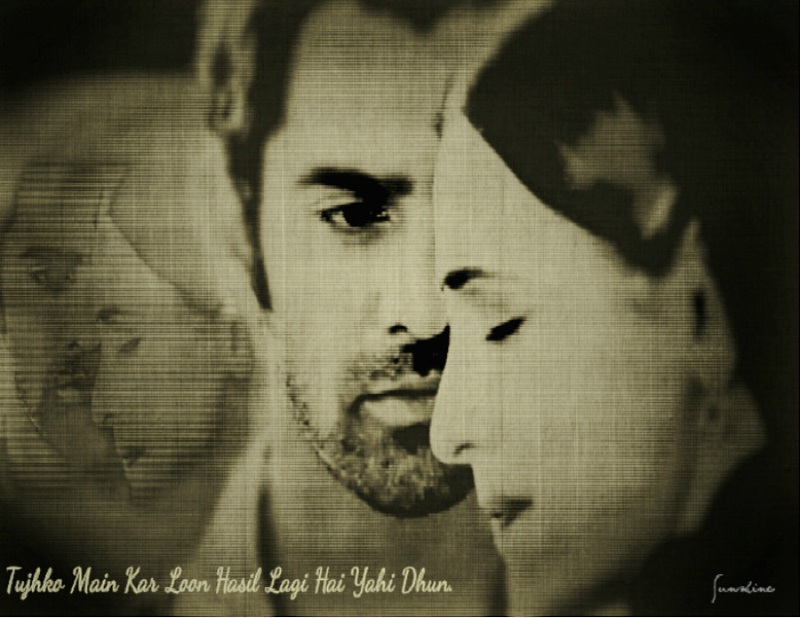 as khushi and akash walked away, la wondered where asr could have met this… this… cartoon. she had pompoms everywhere. ugh. “no problem, khushi ji, if you’re smart, learning to use a computer won’t take you long. check with me and we’ll work it out, ok?” akash assured khushi, and started showing her the basics of using the imac. she sat while he stood behind her leaning over, instructing and demonstrating. “chuha,” khushi laughed and looked up at him. “haan, isse mouse, yaane chuha, kahte hain,” he smiled at her glee at this strange nomenclature. they didn’t hear the door open nor see a pair of eyes flare in anger. khushi clutched the files nervously and knocked on the door, then opened it peering in. “may i come in… sir?” she asked, tentative, she really didn’t want to mess up. too much had happened on her first day, all that shouting downstairs, and the confrontation before that. she stepped in and made her way to him across the room when the young man at the table, head bent over some work, looked up. “arre, yeh toh videshi lagte hain,” she thought. jean pierre saw the lissome girl with smooth creamy skin, a long plait swinging jauntily on one side, a high forehead, expressive hazel eyes, tremulous smile, and stood up involuntarily. she was lovely. and just look at that innocence on the face, enchanting. his gallic heart couldn’t help but respond to this. “e.a., ‘ow do you say zat…executive assistant?!! oh but mees gupta ees too lovely for zat!” clearly, asr’s cold gaze and aloof air were not working on the young man. “please leave the files on the desk and go,” said asr. “‘ello, mees gupta,” chimed in jean pierre at the same moment. khushi had turned to go but turned back again when she heard the greeting. “khushi, j…j..jon! piye… ji, khushi kumari gupta…” she replied, quite bemused, stumbling over the unfamiliar pronunciation then solving it her own way. she’d never met a foreigner before. of course, she’d seen them on tv, and in bhool bhulaiya and the residency and other historical sights, even on the roads in lucknow. but met one she never had. and certainly not such a pleasant young man who looked at her with obvious pleasure. yet, nothing in his gaze embarrassed her. it was almost child like in its quality. khushi wondered how eyes could be so blue. such a nice open smile jon piye ji had. she smiled at him, now losing all her earlier trepidation. she did not see fine lips thinning to an irate grimace, the little asymmetry on their right intensified. “haan, jon piye ji, of course!” her voice was very ‘appy, no doubt about it. “miss gupta, if you’re done discussing the etymology of your name, maybe you’ll excuse us?” flinty eyes looked at her, icicle voice brought a blast of frost into the room. khushi almost leaped at the sudden wave of cold and rushed to do as he bid. nasty man, always being mean. so why did he want her here, she thought as she hurried out. “ahhnav!” jean pierre was back to his drawings, “she is enchanting, … no really… we must ‘ave ‘er for ze bali project you know. i love what she is wearing, so smooth and different, you know… very very different… did you see ze baubles ‘anging ‘ere and zere? zat is ze sixties, zat is a desire, a… ‘ow shall i put eet, a feeling in ze ‘eart… ‘ere you know, in ze deel, the deel?” he was jabbing his chest frantically, trying to make asr understand what he meant, the dil is what he meant as asr understood perfectly, though he showed no sign of it. 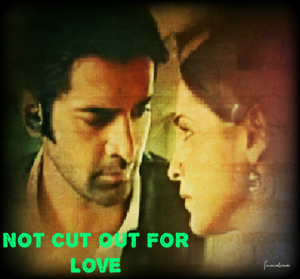 instead asr’s jawline had grown tauter at each word. asr’s fingers jerked and flexed of their own accord. they wanted to throttle something. or someone. there was a knock on the door… that door, again. khushi walked in with a vase full of frangipani. velvety thick white swirls of petals, bright yellow toward the centre, their musky and pure scent wafting across the room. what. what did he wish? “excuse me, sir, akash ji aap ke liye yeh champa phool bheje hain, main yahan rakh doon?” she said and placed them on his desk before walking out. he wished he could see her among the flowers and sands and forests and rivers and winding ways of bali. as he completed the thought, he felt a physical jolt almost. what was he thinking! had he gone mad? Very nice Indrani. ASR is smitten and he has no idea!!!! 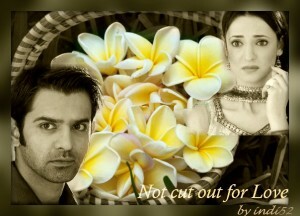 Why don’t you write, produce and direct this story with Sanaya and Barun. It will be a hit . Looking forward to chapter 7.
rashmi, thank you and i grinned as i read your suggestion… nowadays i often think i wish i could at least create and produce one new asr khushi scene. even that would be wonderful. see you soon. Back to Not Cut Out For Love… I just wanted to share with you how beautiful and fascinating I find this story… Khushi innocence… portrayed a million ways… ASR’s personality… drawn so marvelously… His dogged determination to get her into his life… with the flimsiest of reasons… almost a non reason… almost like no explanation needed or offered because he is ASR…. I have fallen head over heels in love with all over again. The things he notices… the things he does… the small things that define his character… the small idiosyncrasies that make up Khushi Kumari Gupta… you have added small touches… added tons of more flavor. I am babbling… It’s because I cannot pinpoint the exact thing that I feel is touching my heart… All I can say is I am loving this… All over again. i am so terribly delighted by that comment of yours. if you feel it’s nutmeg and lace, it is just that… that mace is lacy and seems to almost guard the hard looking nutmeg with its delicate covering… something like lovers maybe? and you’re reading ncofl again, thank you so much. you know, this story was such a joy to write, i used to always say it pretty much wrote itself, it really did. i’d just wait for the moment when it wanted to move to the next chapter, sit before the computer, and the words would race out… i obviously really enjoyed writing it, maybe that’s why it works, who knows. i am so so so happy you like those details and the overall sense of absolute attraction in it. have fun. thank you for the comment, really appreciate it. a call out from the reader is a very gratifying thing. happy new year have a wonderful 2016, see you soon.